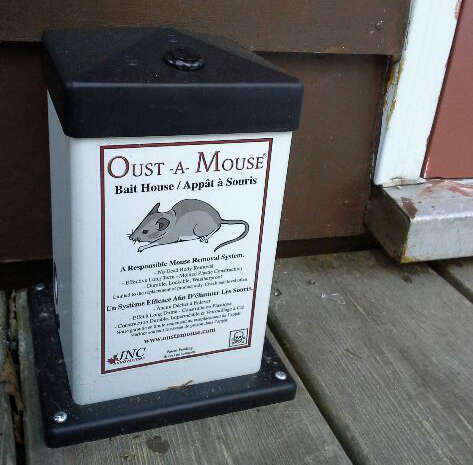 The Oust-a-Mouse is not a mousetrap but rather a lockable, weather resistant bait house. The Oust-a-Mouse is located outside to attract the mice to leave your building to get to the poison bait. Mice enter the bait house, eat some of the poison and then leave in search of water. The poison is then activated and they lay down and go off to sleep outside. No dead bodies to contend with. The Oust-a-Mouse can be mounted to a piece of wood under a cottage or a camper, in a wood shed or anywhere out of the snow so mice can get access to the poison even in the winter months. The small access hole and the locking lid makes it resistant to entry by pets, other wildlife and children. Get rid of mice without mousetraps safely! Studies prove that poison is the most humane method to get rid of mice. If bait levels are maintained, Oust-a-Mouse will keep you mouse-free for many years. The Oust-a-Mouse will get rid of all existing mice infestations and boasts 100% customer satisfaction. Stop placing poison in and around your property. Be responsible and lock it up, You will not only be saving other wildlife but your poison will get to only the targeted rodent and your poison will last longer. Oust-a-Mouse is an alternative rodent control method to stop mice infestations. It is more humane and safer than mousetraps. Website Design Copyright © 2007-2019 Baytides Management Inc.